Ask fellow campers about "Ledges State Park" and nearby attractions. High on location with beautiful scenery. Sites are in need of more gravel, warn away and some muddy. Road is narrow, I have a 38' fifth and lucked in to a large pull through being available. it is self check-in. We camped at Ledges State Park in a Fifth Wheel. This is a beautiful park. The restrooms could use some work. The paint is peeling in the showers. Insect repellant is a must have, as the mosquitoes and other insects are great in number. The park has lots of shade. The fire ring has an adjustable grill, which was very nice for cooking. Bring your old tennis shoes or water shoes so you can walk in the creek off canyon road. It is great fun for the kids and nice to cool off in the summer. It is a bit of a hike down then up from the creek if the road is closed due to heavy rain. If the road is open, you can drive it and go over several bridges covered by water. Would definitely stay here again if we come back to the area. We camped at Ledges State Park in a Fifth Wheel. Buy firewood locally on your way to park as they do not sell it there. The town of Boone is very close by to the north and has at least 3 places to buy groceries. Park has lots of shades. Some sites are fairly level while others require boards or such for leveling. Also, what is not indicated anywhere and no one will tell you is, if there is much rain received, multiple sites flood. Bugs can be quite bad so bring bug spray. Bathrooms are in poor condition and not kept up at all. This is a very popular campground and the surroundings are pretty, its too bad that the facilities are not improved (though I have been told renovations are in the planning stages). I understand old, but not being cleaned properly with the amount of use the bath house receives is disgusting. There is a place to fill water and many sites have electric. The dump is near the entrance. We have camped here for many nights, due to location being close to family. Nice for walking (spray for bugs). We camped at Ledges State Park in a Travel Trailer. Not a bad drive to Ames, IA or Boone, IA both of which are nice towns. 45 minutes to Des Moines, IA. Love this park. Stayed 2 nights. Restrooms were closed so used my own. Electric at site. Fill tank from hydrant and dump on way out. Lots of wildlife. Great sites. Not many RV parks open this time of year. Only problem is too many cares driving through. We camped at Ledges State Park in a Motorhome. This is an old park, and it's beginning to show it. The paint is peeling in the restrooms and showers. The picnic tables are warped and peeling paint. The road to the lower section is still out. They hope to get it open by June. Someone made a mess in one of the lavatory sinks on Saturday, and it didn't get cleaned up until Monday. There was a rock concert in Boone on Sunday so the park was full. The reservable sites had been booked for months. Fortunately we were able to get one of the last walk-in sites. The grass had all been recently mowed, and there was no trash in any of the sites when we arrived. There is no Wi-Fi, and our T-Mobile phone couldn't get a connection. We camped at Ledges State Park in a Travel Trailer. Price reflects Iowa camping coupon. This park has great hiking. The lower part of the park road is currently closed because of a flash flood last year. They are rebuilding the bridge and plan on cleaning up the picnic area. The road is scenic because you can drive through the Pea Creek in several areas. They hope to have the park back to normal next year. The campground is several loops with pull-through and back-in sites. The sites are large and mostly are surrounded by woods. Ames is approximate 11 miles away for services. We will definitely will be back. We camped at Ledges State Park in a Motorhome. We camped overnight at Ledges as it was on our way and was listed as one of the top campgrounds in the National Geographic State Park book. However, the park has obviously deteriorated since National Geographic visited. We pulled into our site and poison ivy surrounded the neglected gravel pad. The park was full, and many people brought large dogs which they let run loose. The park ranger drove right by them and didn't say a word. The bathhouse had peeling paint and the showers had those little buttons on the wall you had to push to get water. The water then stayed on about five seconds, and you had to push it again. We wanted to hike down to the gorge, but the ranger said the bridge had been washed out and hadn't been rebuilt. The park area near the entrance had picnic tables and grills, but the grass was taller than the picnic tables. Overall, it was a disappointing experience. If this is Iowa's best, I am glad I don't live in Iowa. We camped at Ledges State Park in a Motorhome. This is one of our favorite state parks. Level campsites easy to back into or pull through. The rangers are friendly and helpful. Iowa state parks are super because half the sites are on first come/first serve. This makes it much more fair and egalitarian. Not every trip to a state park needs to be planned six months in advance. We camped at Ledges State Park in a Travel Trailer. Stayed 6 nights. Back again on our way north. Very reasonable. Only RV in the park. Some tenters if you can believe that!! Open year round. There is water to fill tanks and dump station along with electricity. Park is great for humans and our dog loves it, too. Will be back. We camped at Ledges State Park in a Motorhome. We stayed 2 weeks to visit family. $11 is the off season price. The shower house was closed but there was water to fill the tank and a dump station. The park is quiet with wildlife and trails. Does have a lot of drive through's nosing around on nice days. Only three campers in the entire park and a boy scout troop from Clive, Iowa chose to set up in our front yard instead of using the designated group camping area, causing us to move. Then they left their garbage laying out for the crows to make a mess instead of using dumpster. Sad. What happened to teaching scouts consideration? Suggest the rangers enforce their rules as both of these are posted. We will stay here again. We camped at Ledges State Park in a Motorhome. Wonderful park conveniently located to Boone and Ames. Spaces far apart with several pull-thrus. Staff and camp-host are extremely friendly. Choice of shade, sun or partial. Iowa policy is to reserve half the park on reservations and the other half first-come. The sites are properly marked as to which they are making it easy to make a decision and not worry about having to move. Park is well-maintained. They even put in new fire grates while we were here. Perfect for visiting this area. Would stay here anytime. We camped at Ledges State Park in a Travel Trailer. A nice, slightly out of the way state park. Has lots of big trees, many birds. Bathrooms need a little updating but were functional. Iowa arboretum is very close. Also, it's close to Ames, Iowa where there is plenty to do. Iowa state parks are a great deal and we would stay here again. We camped at Ledges State Park in a Motorhome. This campground was very nice with mostly shaded sites. Though there is not water on each site, connections were close enough to most sites to refill your tanks. It was pretty quiet during the week but completely filled up for the weekend. There are 13 miles of hiking trails within the park. There are also, surprisingly, sandstone cliffs that rise 100 feet above the streams on the west side of the park. We enjoyed our stay and would definitely stay here again. This park is located just south of Boone which has, among other things, the Boone Scenic Railroad. We camped at Ledges State Park in a Motorhome. 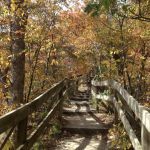 Are you affiliated with Ledges State Park ?